Allen Auditorium - University of Missouri - PWArchitects, Inc. The latest in audio/visual technology, excellent acoustics, and 300 comfortable seats on a handicapped accessible sloping floor are some of the amenities of this refurbished auditorium. Baseboard heating and ceiling air conditioning are just some of the creature comforts that enable students to maximize their learning experience. This renovation gave new life to a 1960 portion of the Arts and Science Building on the University of Missouri campus. The auditorium, built in a time of lesser code requirements, is now updated with all code requirements including a sprinkler system. The three-level light system, comprised of cove lights, recessed fluorescent, and recessed cans, gives the room a different ambiance according to the instructor’s needs and wishes. 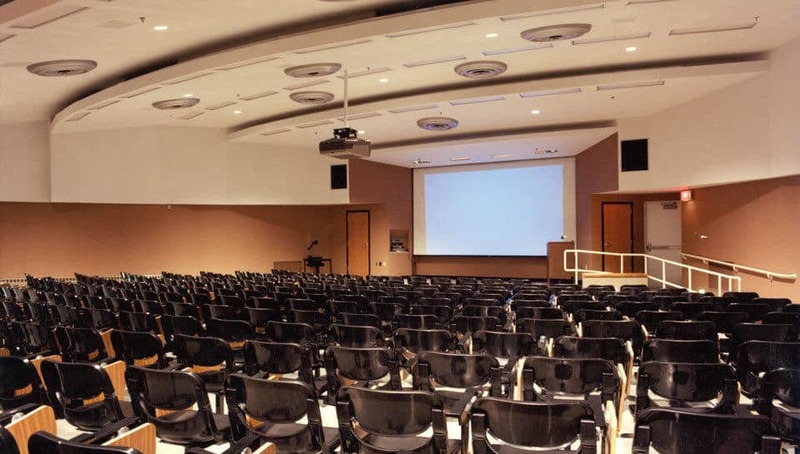 Easily accessible to both the building occupants and the general public, Allen Auditorium has been a useful and much-used facility at the University.